American sterling silver large embossed bright cut floral engraved napkin ring by Gorham Silversmiths, date marked for 1880. 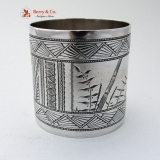 This beautiful napkin ring is 1 7/8" in diameter, 2" tall and weighs 60 grams or 2 ozs Troy. Monogrammed AHM in an ornate period script. The excellent original condition and clear detail, with no removals, repairs or alterations, make this an especially attractive offering.